Bishop Cirilo Flores, who is recovering from a stroke he suffered just before Easter, is still being treated in a local hospital, according to the Diocese of San Diego. Monsignor Steven Callahan said in a statement Thursday that Flores, 65, has been undergoing treatment and tests since he fell ill April 16, but that he was expected to go home from the hospital in the near future to continue his recovery. 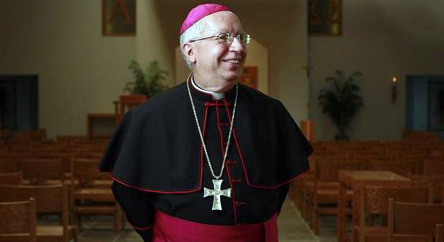 “Bishop Flores is grateful for all who have been praying for his recovery to good health,” Callahan said. Flores, a native of Corona, became the fifth Catholic bishop of San Diego last September when he succeeded Robert Brom. He was working in his office at the Pastoral Center just days before he was set to make his Twitter debut when he was stricken. The bishop had planned to send out his first tweet on Easter Sunday, and then tweet every Wednesday, according to The Southern Cross, the diocesan newspaper. A Loyola Marymount University graduate, Flores earned a law degree at Stanford University and spent many years as a priest in Orange County after being ordained in 1991. He was named an auxiliary bishop in 2009, and was named a coadjutor bishop in 2012. Though he hasn’t tweeted yet, Flores has 170 Twitter followers. You can follow Flores on Twitter at @BishopFlores.